Endeavour Community Sailing, a non-profit educational sailing organisation “dedicated to engaging young people from different socioeconomic backgrounds across Bermuda with experiential learning” is partnering again with the Bermuda College Division of Professional & Career Education to offer a career development and training opportunity for Bermudian youth aged 16 and older. A spokesperson said, “The 7-week intensive training programme provides Bermudian youth ages 16 and older an amazing opportunity to obtain internationally recognised qualifications and valuable experience to springboard into a maritime industry career. The programme aims to increase exposure to maritime career pathways and enhance employability skills for local youth to start a career in the maritime industry. Tia Tankard, Club Development Officer for Endeavour Community Sailing, said, “it’s incredible to know that over such a short period of time the programme participants are able to accomplish significant personal and professional development. From their communication and presentation skills to their sailing instruction abilities – their remarkable effort and teamwork skills have been inspiring to observe. “As well as the hands-on training and sailing instruction skills, participants benefit from skills development including teamwork, communication, presentation, problem-solving and decision-making. They improve their resume writing and interview preparation skills, learn about training and education requirements, career pathways, how and where to apply for jobs, and gain exposure to contacts in the maritime industry both locally and overseas. Tom Herbert Evans, Endeavour’s Community Sailing Manager, said, “what started out as a vision to expose local youth to the diverse range of career opportunities in the international maritime industry has had a meaningful impact on our community through the lives of the 11 youth participants who embarked on an ambitious journey representing the first cohort to participate in the programme. “The maritime industry is full of opportunities for Bermuda’s youth and the Endeavour Maritime Careers Springboard Programme provides participants with invaluable exposure into the variety of roles available as well as offers the initial training and qualifications for participants to jumpstart their careers. Tre Maxwell, Endeavour Programme Instructor, said, “The programme has opened a lot of new job opportunities both internationally and locally. It enabled me to achieve many qualifications which are all very beneficial to finding jobs throughout the maritime industry.” A positive success as Tre has recently joined the Endeavour Community Sailing team after working at the Andrew Simpson Watersports Centre in Lake Garda Italy earlier this year. Karen Smith, Bermuda College PACE Programme Coordinator said, “Bermuda College is very excited about partnering again with Endeavour Community Sailing. Bermuda is the perfect training ground for such a programme. “The 2019 Endeavour Maritime Careers Springboard Programme will take place from Monday to Friday starting January 14th and concluding on March 4th. Spaces are extremely limited and interested applicants are encouraged to submit a cover letter outlining why they are an ideal candidate for the programme and their resume outlining their skills set via email to education@endeavour.bm by 5pm on November 30th. “Those who are shortlisted will be invited to an interview with a selection panel in early December. 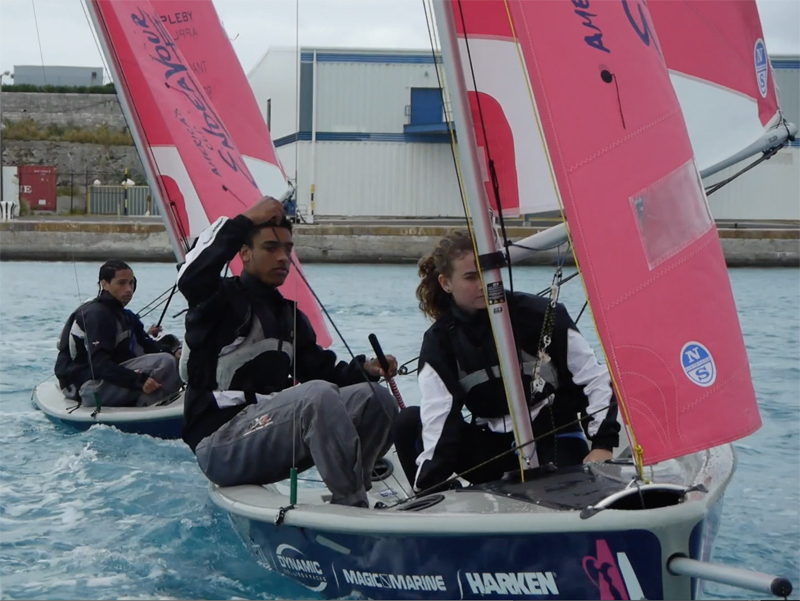 Participant costs are approximately $1,200 each, covering certification and course fees, books, administrative fees from the Bermuda College and RYA coach fees for the international assessors. Financial assistance is available on a needs-basis only. Well done to all, it is very nice to see the Americas Cup having a continued positive impact on our island. Long may it continue.